This work, like Women in the Garden, shows the influence of Edouard Manet (1832-83) - the so-called 'father of modern art' - who was something of a hero figure to the younger painters who were to become the Impressionists. (Manet, although an acknowledged leader of the avant-garde, longed for an official recognition which never came. See his first significant but controversial work Dejeuner sur l'herbe (1863). See also: Impressionist Edouard Manet. In one respect, however, Monet's painting practice diverged from Manet's, as the latter painted in his studio from studies while Monet increasingly painted in the open air, directly from his subject. As he became more successful the need to exhibit at the Paris Salon diminished and he painted no more large-scale, would-be "exhibition" pieces; the outdoor paintings were usually smaller in size and much more freely painted than studio works. Monet used a number of terms to describe his studies, among them being: esquisse, which was a preliminary sketch or working drawing; ebauche, a rough oil sketch; pochade, which was another term for a sketch, more commonly applied to colour-key design; etude, a part study to resolve some specific painting problem; and croquis, a rough draft. He used these words in a way slightly different from their usual meanings, but for Monet the distinctions were essential. He also employed two terms that were peculiar to him, one such being "impression", a word which he incorporated into the titles of several of his works. His other specialized and individual term, enveloppe, had an even more precise meaning for him, and was used to describe the way an object was surrounded by light. In September 1869 Monet wrote to Frederic Bazille (1841-70) saying that he had made some bad oil sketches (pochades) of La Grenouillere. 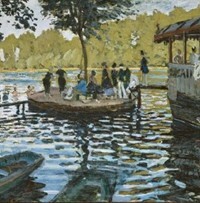 These sketches are probably this painting and its sister - a less developed pochade - Bathers at La Grenouillere (1869, National Gallery, London). The broad, loose brushstrokes here are evidently those of a sketch. For his exhibition paintings Monet typically created a more carefully worked surface. Even so, a number of art critics consider La Grenouillere to be one of Monet's best Impressionist paintings of his early period. One of the key's to Monet's rapid painting technique in this work, is the tache, or patch of colour, a broad, evenly-loaded brushstroke, made possible by the invention of the metal ferrule, which allowed the manufacture of flat (rather than round) brushes. These flat brushes made it much easier and faster to apply paint onto the canvas. Note, for instance, the reflections in the restlessly moving water which are created by quickly-applied broken horizontal slabs of paint. Other shorter dabs of colour also render the foliage of the tree (centre). The human figures, too, are given equally summary treatment as the flat brushstrokes fly over the picture, capturing form and substance, as well as sunlight. Overall, La Grenouillere is not a highly finished painting: the surfaces are quite rough in comparison with the usual Salon works. The brushstrokes are broad, bold and directional, often overlapping, with the paint applied fairly oily. Yet, like most of Monet's paintings, it conveys an accurate snapshot of the sunlight and its resulting colours. Claude Monet's first real success.  Impression, Sunrise (1873) Musee Marmottan-Monet, Paris. The canvas that christened the greatest art movement. By Claude Monet. One of several paintings of the Parisian station by Claude Monet. Monet painted this so fast, there is sand on the canvas. Typical Impressionist scene of an everyday landscape. Monet did more than 250 expressionistic landscapes of his garden at Giverny. One of a series of eighteen views of Monet's Japanese style foot-bridge. NOTE: For the story behind the Impressionism movement and the group of French artists who started it, see our 10-part series, beginning: Impressionism: Origins, Influences. We gratefully acknowledge the use of material from MONET (2002) written by Trewin Copplestone, an essential read for any student of fine art.  For the meaning of other Impressionist compositions, see: Homepage.